GSA member Zhao Zhang was named as one of 16 recipients of the NIH Director’s Early Independence Award for 2015, joining Jason Sheltzer. Established in 2011, the Early Independence Awards program provides an opportunity for exceptional junior scientists who have recently received their doctoral degree or finished medical residency to skip traditional post-doctoral training and move immediately into independent research positions. This has been a good year for Zhang, who was honored with the Larry Sandler Memorial Award from the Drosophila community and GSA, which is given annually to honor an outstanding PhD dissertation in research using the fruit fly Drosophila. 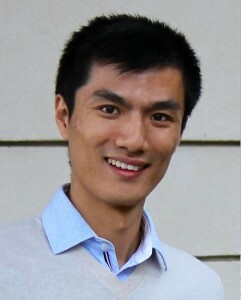 Zhao Zhang established his own research lab at Carnegie Institution for Science, Department of Embryology in 2014, after receiving his Ph.D. at University of Massachusetts Medical School under the guidance of Phillip Zamore and William Theurkauf. Since graduate school, he has been fascinated by the most abundant element in our genome, transposons, also known as jumping genes. During his Ph.D., he studied the mechanisms that suppress transposons in animal germ cells to maintain animal fertility. Now his lab is building tools to understand how transposons are controlled in somatic tissues, particularly under aging and disease conditions, such as cancer.